A terrifying, enigmatic and ever-accelerating story about the power of imagination. Jack Peter Keenan has always been an odd boy. Even before the accident three years ago, he was not exactly normal. Now almost 11 years old, he doesn’t go outside, ever. As Christmas approaches, there are strange happenings afoot: things that go bump in the night, apparitions in the snowy roadway, screams of people who aren’t there. Jack has begun drawing monsters. His parents, Holly and Tim, are increasingly worried. Holly renews her relationship with the church; when she seeks answers, the local priest and his Japanese housekeeper pelt her with tales of shipwrecks and spirits. Tim resolves to work harder with his son. The parents of Jack’s one friend, Nick, take off for the holiday, leaving him to stay with the Keenans in their remote Maine beachside home, in the snow and bitter cold. As Jack’s drawings multiply and the howls outside grow louder, readers will wonder if he’s withdrawing, abandoning reality (and pulling Nick and the Keenans along with him), or if somehow his interior landscape is populating the outside world. 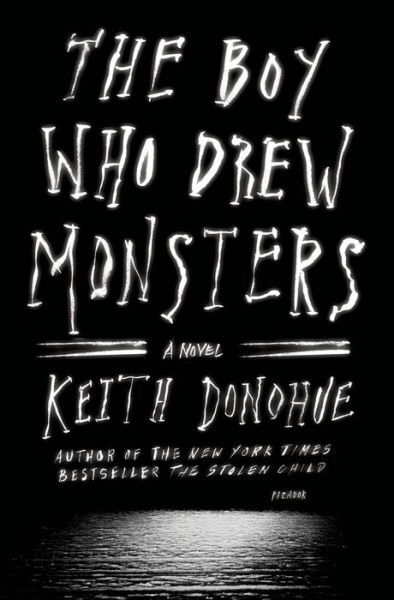 Multiple mysteries enliven the terror of The Boy Who Drew Monsters, which becomes ever more disturbing as the source of danger comes gradually into focus. In his sensitive, incisive treatment of Jack’s behavior and its effect on his family, Keith Donohue (The Stolen Child) explores the challenges of mental disorders, but suspense and a bright thread of terror evoke the very best of the horror genre. Just as a Maine winter chills the bones, this singular little boy provides a satisfyingly frightening story. This review originally ran as a *starred review* in the October 10, 2014 issue of Shelf Awareness for Readers. To subscribe, click here, and you’ll receive two issues per week of book reviews and other bookish fun!